In a simplified version of history, the Scottish Covenanter movement sprang from a smouldering fire to a huge bonfire through the actions of one Jenny Geddes. A devout member of the Scottish Kirk, Jenny was in St Giles the day the dean chose to read from the new Book of Common Prayer, and so incensed was she by these proposed changes to her familiar liturgy that she stood up and spontaneously hurled her stool at the poor dean. Whether spontaneous or not – and a lot of things point to this being a well-planned protest – it is a fact that when the new Book of Common Prayer was introduced, the majority of the Scots were already convinced this was a fiendish attempt at weaning them away from the true religion as advocated by the Scottish Kirk, luring them into the dangerous mires of popery. Had Charles I understood just what havoc his insistence on implementing this new Prayer Book was to have, he would probably have desisted. However, being anything but prophetic, Charles I took a mulish approach to the loud protests from Scotland, and in so doing fanned the flames of religious fervour into a devastating inferno that was to consume his three kingdoms and ultimately cost him his life. 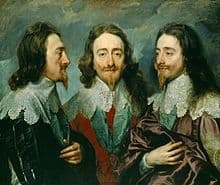 Charles I was neither unintelligent nor uneducated – rather the reverse, in fact – but he does seem to have had a tendency to compensate his short stature with an authoritarian approach to most things in life. As anointed king, he firmly believed it was his responsibility and duty to care for his subjects, leading them up the right path in all matters, including faith. Minor obstacles such as the said subjects reluctance to follow him down the chosen path, mainly because they did not agree with their king’s opinion in matters of faith, were generally ignored by Charles, who to further undermine his religious credibility in his kingdoms committed the faux-pas of marrying a catholic princess – not a popular move in a time and age when the whole of Europe was a battlefield between the Protestants of the north and the Catholics of the south. So what was the argument about? What were those principles of faith that had the majority of the English – and Scottish – citizens of the seventeenth century walking about with their knickers in a twist? (Not that all that many of them had any knickers to twist in the first place …) Well, to answer that we must leapfrog backwards a century to the heady age of the Reformation. In England, Henry VIII proclaimed himself the Head of the Anglican Church, disbanded the clerical orders and severed his ties with Rome. But the rituals remained virtually unchanged, the Anglican Church building on the medieval (and therefore catholic) rites that were already well-established within the kingdom. In Scotland, the Reformation was led by John Knox, a disciple of Calvin himself, but was ultimately a bid for Scottish independence from the French interests as represented by Marie de Guise, mother of Mary Queen of Scots. The hundred or so Scottish nobles that headed this coup probably found it convenient to set a religious label on their actions – it had a better ring to it than to admit they were only doing this to protect their own interests. However, in difference to England, the Reformed Scottish Kirk very quickly divested itself of “popish” ritual and practise, emphasising instead the importance of the Word (scripture) and faith. By the seventeenth century, the Scottish Kirk was a robust and thriving organisation in which the local parishes played a strong role. It was also an organisation dominated by leaders who shuddered at the thought of having their cleansed and purified Kirk besmirched by the papist trappings that still lingered in the Anglican Church. So when Charles I decided to harmonize the religious practices in his three kingdoms by advocating a Book of Common Prayer he was throwing in a lit fuse in a munitions store, and eventually the whole thing exploded in his face. A Book of Common Prayer valid in all three kingdoms was not a new idea. Already James I (VI) had tried to go down that way, but having far better political instincts than his unfortunate son, he backed off in the light of the Scottish protests. In difference to Charles, James understood his Scottish subjects, having spent his first 37 years as king of Scotland only. Charles on the other hand was born in Scotland, but he was raised and educated in England, and his first visit to Scotland was for his coronation in 1633. As stated above, Charles was also somewhat jealous of his royal prerogative, and where his father would have been open to discussions about the incendiary book, Charles refused to budge. He was the king and knew best what his subjects needed to fortify their spiritual life. The Scottish Kirk wasn’t about to keel over without a fight. Upon hearing that Charles was planning a new Book of Common Prayer, the Kirk began its countermoves which involved all the parishes but also a massive PR effort with a number of printed documents (pamphlets, tracts) defending its principal tenets of faith. 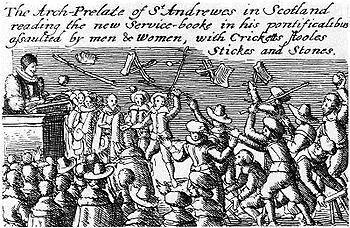 Well before the Book of Common Prayer had been published “everyone” in Scotland knew that it was full of potentially popish garbage, and matrons in Edinburgh were heard protesting about this terrible little book well in advance of Jenny’s little stunt with her stool. 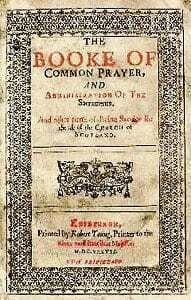 On Sunday 23 July 1637, a number of loyalist ministers and bishops set out to their respective churches to use the new Book of Common Prayer for the first time. By the time the sun set, all of them had realised that implementing the new liturgy was a bad idea. Too bad they never got Charles to understand this. Over the coming months the protests did not abate – rather the reverse – and when Charles finally grasped just how serious the situation was, it had already snowballed into an unstoppable avalanche. Charles I recognised the Covenant for what it was; a thrown gauntlet telling him quite clearly that should he not hold to his coronation oaths, well then … Unfortunately for him – and the thousands upon thousands of civilians that were to lose their lives, homes, families in the coming conflict – Charles severely underestimated his adversary, calmly convinced that his forces would prevail against whatever army the covenanters might put together. They didn’t, and even worse, the Covenanters inspired people of similar beliefs in England to also take up arms. The rest, as they say, is history, ending for Charles I on a cold January day in 1649 when his head was severed from his body. 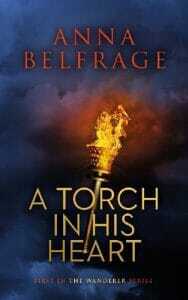 This post was originally written for the EHFA blog. This is a great site to visit if you’re into history!